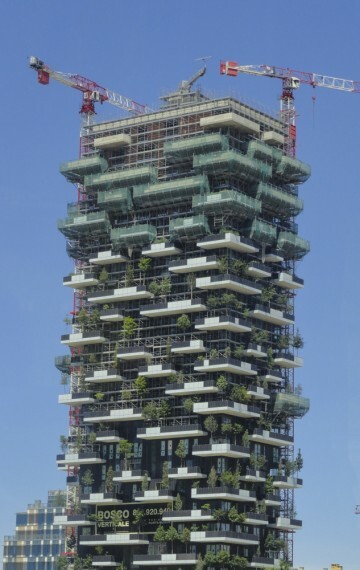 When developers in Italy wanted to do full-scale testing on how hundreds of trees on terraces of two residential towers in Milan would hold up in winds in excess of 100 miles per hour, they turned to FIU’s Wall of Wind. The Bosco Verticale (vertical forest) will host more than 900 trees across 96,000 square feet of terraces. The trees are intended to mitigate smog and produce oxygen while also moderating temperature and controlling noise. Small-scale testing of the buildings’ unique vegetated design was initially done at Polytecnico di Milano, which then contacted the International Hurricane Center’s (IHRC) 12-fan Wall of Wind, the largest and most powerful university research facility of its kind, capable of simulating a Category 5 hurricane – the highest rating on the Saffir-Simpson Hurricane Wind Scale. IHRC researchers conducted full-scale testing of trees to determine realistic wind loads on various types of trees and the planter design to securely hold them in the balconies, which is impossible to do using small-scale models. These March 2012 tests complemented Polytecnico di Milano’s small-scale tests to see the interaction of the two vegetated buildings with the buildings and cityscape around them. Vertical Forest in Milan from Stefano Boeri Architetti on Vimeo. Very nice! Europe could use more trees in the city…..
Why just Europe? Why can’t we use that here? These kinds of buildings can serve multiple purposes, plus it looks extremely cool. This is awesome and I want to be a part of it.